Carol Shea-Porter: College Does Not Necessarily Make You Employable. Or Smart. Carol's current column is titled "The burden of student loan debt"; it appears at her government-provided website and residents of NH01 may see it at some point as an op-ed in their local papers. I am reproducing her entire column here, lest I be accused of quoting out of context. Carol's words are (appropriately) on the left with a lovely #EEFFFF background color; my comments are on the right. Spring is here, and a joyful tradition – the graduation ceremony – is being carried out across our state and around the country. Newspapers show the mostly young graduates flashing big smiles, throwing caps in the air, and celebrating with their families, friends, and other students. An observer of rituals would not know whether this was three decades ago, when my class finished graduate school at UNH, or this year. Goopy sentimentality. Zzzzz. A cynic might suspect that Carol is attempting to evoke the good feelings associated with milestone celebrations and ceremony in order to have us buy into the rest of her column. Or she might just be trying to pad her column's word count to the standard 700-800 expected for newspaper op-eds. It's sometimes hard to tell with Carol. However, there is a huge difference, one that undermines our middle class and threatens both the graduates’ future plans and our country’s future. That difference is the amount of student debt, and as a nation, we must address this growing crisis if we want the American dream to live on for the middle class. Carol does not mention that another "huge difference" in the past few decades has been the ever-increasing role of government in higher education. Its efforts to "do something" about college financing has led to… well, where we are today, with a "growing crisis." But don't worry, I'm sure that this time the government will "do something" to fix things. Carol is on the case! Most students have to both borrow and earn money at jobs to go to college. I certainly did. 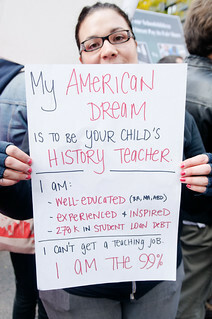 What is different is the cost of school now, and how much these young people and their families need to borrow. Carol writes as if skyrocketing college costs and massive student debt "just happened", like a hurricane or earthquake. Many of this generation are unable to reach their dreams simply because they cannot borrow enough to attend school. USA Today had some sobering statistics about the students who could find money. In an article appropriately titled “Will you marry me (and my student loan debt)?”, the reporter wrote, “About two-thirds of college grads in the Class of 2013 will graduate with some student loan debt. The average debt is about $28,000.” You can read the USA Today article Carol references here. Why, it's almost as if some perverse incentives were at work. I wonder where they came from? This is outrageous. Young people, who should be sailing into a bright future, are struggling to pay college debt. When I finished school, I remember tight budgets, but I also remember my generation planning for marriage, to buy a car or a house, or to go to graduate school or start a small business. The loan burden is too great now for too many. How many ways can Carol find to say the same thing? Even non-skeptical readers might begin to notice that she's going on and on about the "outrageous" symptoms of the problem; she is remarkably uninterested in ferreting out any underlying causes. Bloomberg reporter John Hechinger wrote in his article, “Overdue Student Loans Reach Record as U.S. Graduates Seek Jobs“ that, “Eleven percent of student loans were seriously delinquent - at least 90 days past due - in the third quarter of 2012, compared with 6 percent in the first quarter of 2003...” You can read the Hechinger article here. Again, the evidence fairly screams of a set of perverse incentives, obvious to anyone who's not a politician: students were led to badly misjudge the risk of assuming debt. Certainly some of the fault was theirs. Was it anyone else's? Cui bono? Again, Carol's totally uninterested in raising uncomfortable questions like that. The article goes on to state why young people still need college: College graduates have an 87 percent employment rate and high school graduates have a 64% employment rate. Carol's factoid (also from the Hechinger article) does not show that people "need college". At best it shows that, given a choice between a college graduate and a high school graduate, employers might be more likely to pick the college grad, irrespective of whether the job actually requires college-level skills or not. Other data tend to discredit the "still need college" mantra: "About 48 percent of employed U.S. college graduates are in jobs that the Bureau of Labor Statistics (BLS) suggests requires less than a four-year college education. Eleven percent of employed college graduates are in occupations requiring more than a high-school diploma but less than a bachelor's, and 37 percent are in occupations requiring no more than a high-school diploma." A telling anecdote from the same page: "The proportion of overeducated workers in occupations appears to have grown substantially; in 1970, fewer than one percent of taxi drivers and two percent of firefighters had college degrees, while now more than 15 percent do in both jobs." Put another way: a substantial fraction of kids are going to college who don't need to, are wasting their money and time doing so, and (side effect) taxpayers are getting stuck with the bill for their delinquent loans. Student debt is now larger than credit card debt in this country. This debt could jeopardize our economy. We also can see by the employment numbers that we have to keep educating our young. After all, education is the key to prosperity, for the young and for our economy. The question is not whether to educate, but how to pay for it. Carol blithely demolishes a straw man, taking a brave stand against all those people out there who think there is a question about "whether to educate" American youth. Nay, for Carol, she'd rather just ask: how much more can the American taxpayer shovel into the gaping maw of the higher education system? Since Carol doesn't recognize the role of past government decisions in setting up the corrupt financing structure of higher education, she can't be expected to come up with any intelligent reform proposals. And she doesn't. These big corporations like Facebook should have to start paying federal income taxes, just like small businesses and individuals have to. Citizens need educated leaders who will be able to face the challenges tomorrow brings, so they need to insist that their colleges and universities are properly funded. And finally, schools themselves need to be better stewards of money. Education has to be the prime reason to brag, not the new gym or the new waterfall on campus. As we've seen in the past, there's not a single dollar in private hands that Carol Shea-Porter doesn't imagine the state could spend more wisely and humanely. In this specific case, Facebook could cough up some more dough, couldn't they? Congress also has a role to play. I was proud to support and pass the College Cost Reduction and Access Act, the Higher Education and Opportunity Act, and the Student Aid and Fiscal Responsibility Act in previous sessions of Congress, but there is so much more to be done. Translation: "I had a major role in setting up this perverse system that puts ever-increasing numbers of young people in financial peril for dubious benefits. And I'm willing to finish the job!" Tuition is too high. Interest rates for bank loans for school are too high. Carol knows what the "correct" tuition and interest rates should be. She's smart! She went to UNH! This 113th Congress cannot even agree on how to at least reduce the interest rates that students and their families pay on federal loans. While we can get 3 percent interest rates for new homes, interest rates on federal school loans will double, from 3.4% to 6.8%, on July 1st unless Congress acts. Unfortunately, both Republicans and Democrats are largely in agreement that the inherently broken federal loan system should continue; they only differ in relatively minor details. Last week, House Republicans passed a bill, H.R. 1911, that would allow interest rates to be reset each year and would actually cost more than allowing the rates to just double. The Senate rightly will reject it. For our children, for our businesses, for our country, we must keep interest rates at 3.4% and then work to reduce the other costs. After all, education really is the key to prosperity for all of us. Other than the obvious stupidity of letting legislative action set interest rates, Carol's telling is predictably partisan; for a slightly more skeptical take, see this Roll Call article that lays out the positions of the various parties, and notes that practically nobody in the debate is being "honest and transparent about their positions and motivations." Fearless prediction: the outcome of this "crisis" will involve some tinkering, but too many students and their families will continue to be deluded into bad financial decisions. Colleges will still happily gobble up the free income, using it to fund Assistant Vice Provost positions and the like. And a few years down the road, Carol or her replacement can issue another column pointing with alarm to the same "growing crisis". And taxpayers will find themselves increasingly responsible for it all. In the years since, it's only gotten worse.